November Is Our Bad Usage Month: What’s That in Your Pudding? This article has its origins almost ten years ago. My mother was recounting some complicated story about some of our other relatives. I was preoccupied by something else at the time and not paying close attention. In my defense, I did try my best to keep up by nodding and murmuring comforting words every now and then. Then, suddenly, my focus shifted. Mom had said something … odd. “What did you say?” I asked. My mother is one of the smartest people I know. If she tells you that some goofy, misquoted catchphrase is now “something people say,” you’d better believe it. 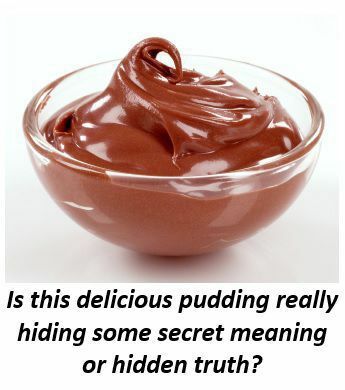 It turns out that LOTS of people say “the proof is in the pudding,” even though they’re not quite sure what it means. We’re going to use this month to look at peculiar, yet common, usage errors: malapropisms, lapsed syntax, mangled idioms, and all the other ways that people use words in the wrong way. And when I say “people” are making these mistakes, I mean that skilled and seasoned professional content writers have made these mistakes. In fact, even if you have a great professional website for your business, law practice, or medical clinic, it’s quite possible one of these mistakes is lurking somewhere on one of your web pages. We are going to cover 20 examples, and we have only one month, so we’d better get moving. Don’t worry; I promise you will get to the pudding along the way. A malapropism occurs when a writer or speaker reaches for a word at the edge of his functional vocabulary, and grabs a word with a similar sound but a different meaning. The term comes from the name of a character—Mrs. Malaprop—in an 18th century comic play. The phrase “unchartered waters” provides an excellent example of a malapropism. The writer intended “uncharted waters,” in the sense of an ocean or sea that has not been mapped or explored; it’s a powerful metaphor. Unfortunately, “unchartered” is an adjective describing a business that has not been officially recognized by government; its synonyms include lawless and unauthorized. Try not to giggle when someone uses a malapropism in spoken conversation. Some writers prefer “oftentimes” as a way to provide contrast with “sometimes.” I can’t say these writers are wrong, exactly, but they’re probably sending a subtle message they don’t intend. The chief usage errors associated with “comprise” fall into the categories of incompleteness, reversal, and the false passive construction. We’ll look at each of these in turn. Incompleteness. The word comprise indicates that the list of parts making up the whole is a complete list of parts. “Comprise” is a more comprehensive verb than “includes.” You would never say, “My family tree comprises my grandfather,” for instance, because many other people are omitted. It’s an error when the direct object of the verb comprise doesn’t specify the full contents of the subject. “Is comprised of,” the false passive construction. The writers who use this phrasing give it the same meaning as “comprise” as an active verb: “to be built from.” Most dictionaries find this usage unacceptable. This is a modern misstatement of an old proverb, “The proof of the pudding is in the eating,” where “proof” meant “test.” In other words, sampling will determine if the recipe is any good; metaphorically, the phrase means “the results will show whether our attempted solution was the right approach.” The original proverb has been traced back to the early 17th century, but the modern version appears to have originated in the early 1900s. If you want to quote proverbial wisdom, please do use the original version. It’s now so uncommon that it will seem fresh, rather than clichéd. Disinterested does not mean the same as uninterested, although I could show you a number of writers who believe otherwise. “Disinterested” means impartial or lacking a stake in the outcome. That’s a positive quality in some circumstances (for instance, when you’re looking for an unbiased judge or mediator). “Uninterested,” in contrast, always has a negative connotation: it describes someone who is bored, unenthusiastic, or uninvolved. Do not mix up the two words. Aggravate means to make something worse. It does not mean to irritate, annoy, bother, or provoke. “Eating cold anchovy pizza aggravated my gout” is a legitimate use of the word if the writer already was suffering from gout in the first place. In future weeks, we’ll take a look at some other usage errors and solecisms, including the key question of whether or not it’s okay to say “whether or not,” and why it’s a bad idea to boast of the “quality” content on your website. Until then, you can always get advice on usage and grammar from our web content mavens by clicking on the instant chat icon on this page.